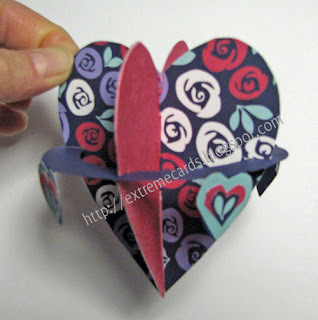 This hanging heart ornament began with a design by Marilyn Scott Waters, the Toymaker. I used my own paper instead of printing the one from the site. Which is very cute, by the way--I had some paper I wanted to use, that's all. Here's a little piece of Marilyn's printable design. Isn't it pretty? Let's not mention the slight issue I had with cutting the slots on both hearts the same instead of opposite. Darn. 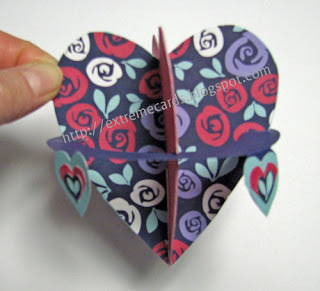 I was able to rescue the project by leaving the hearts solid in the center rather than cut out. Assembly is simple. 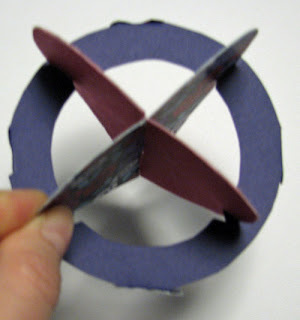 Just slot the two hearts together and use the center ring to hold them in place.